Located in Lossiemouth, Jomarnic B&B is a 3-minute drive from Moray Golf Club and 5 minutes from North Sea. Featured amenities include complimentary wired Internet access and express check-in. Guests may use a train station pick-up service for a surcharge, and free self parking is available onsite. When you stay at St. Benets Abbey - Guest house in Bodmin, you'll be within a 10-minute drive of Beacon Hill Obelisk and Bodmin Jail. Free self parking is available onsite. With a stay at Edward Hotel in Blackpool (North Shore), you'll be within a 10-minute drive of Blackpool Pleasure Beach and Blackpool Central Library. The front desk is staffed during limited hours. With a stay at Rutland Guest House in St Leonards-On-Sea, you'll be within a 5-minute drive of St Leonards Gardens and Warrior Square Gardens. Located in Truro, The Victoria Inn is within a 15-minute drive of St Agnes Museum and Royal Cornwall Museum. The front desk is staffed during limited hours. Free self parking is available onsite. With a stay at Rossetti Lodge in Birchington, you'll be near the beach, within a 15-minute drive of Dreamland and Minnis Bay. Located in St Austell, Arches B&B is a 3-minute drive from Wheal Martyn China Clay Country Park and 6 minutes from St Austell Brewery. Free self parking is available onsite. 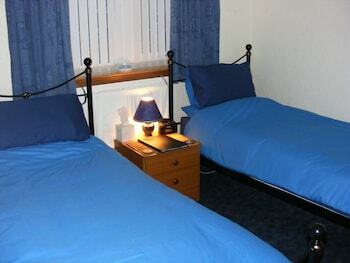 Located in Dalbeattie, Dalbeattie Guest House is within a 15-minute drive of Kippford Beach and Rockcliffe Beach. Free self parking is available onsite. With a stay at The Eltisley in St Neots, you'll be within a 15-minute drive of Papworth Hospital NHS Foundation Trust and Wyboston Lakes Golf Course. Free self parking is available onsite.